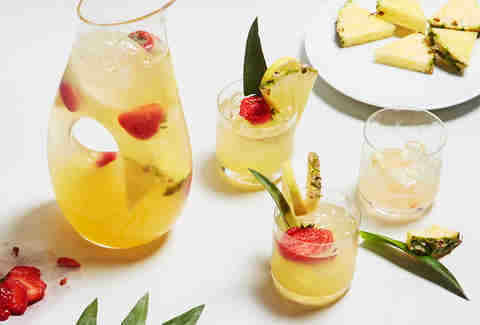 Tropical drinks shouldn’t be relegated to just summer time, which is where the inspiration for this bright cocktail comes from, with its bold pineapple and coconut flavors. Hey, you’re eating breakfast foods past noon -- there are no rules when it comes to brunch. No Sunday Funday is complete without brunch -- and no brunch is complete without cocktails. To help you mix up the best drinks possible, we paired up Sourced, Smirnoff’s newest line of vodka infused with real fruit juice*, and bartender extraordinaire Crystal Chasse, from an NYC cocktail lounge, to concoct a few brunch drinks worthy of Sunday Funday. Using Sourced’s three flavors, we came up with three cocktails for the next time you pile into your pal’s kitchen for some pancakes. 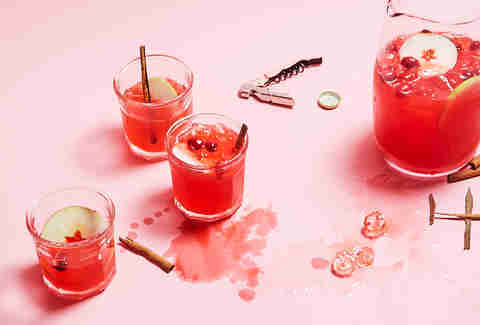 Oh, and because you’re obviously going to be having these with your friends, we also threw in measurements for a batch that serves six -- so call your mom and ask her to borrow the fancy punch bowl. *Made with 10% real fruit juice from concentrate. Add sliced strawberry and lemon juice into a shaker tin and muddle. Add Smirnoff Sourced Pineapple, coconut water, and honey syrup*. Shake and double strain into a rocks glass. 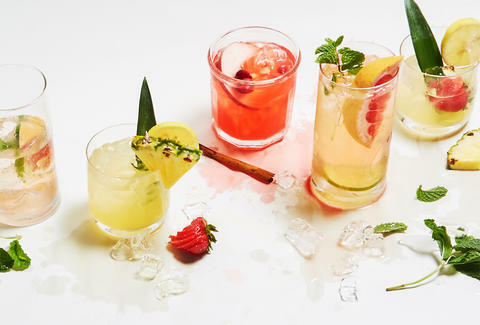 Add ice and feel free to garnish with pineapple leaves and strawberry slices. Because regular honey is too thick for mixing into a cocktail, creating a light syrup will help the sweet stuff play nice with the other ingredients in your drink. Take equal parts honey and water and heat in a saucepan until the honey melts into the water. Wait for it to cool and then place into an airtight container before sticking it in the fridge. Add sliced strawberry and lemon juice into a separate bowl or tin. Muddle ingredients and pour into a large serving or punch bowl. Then add Smirnoff Sourced Pineapple, coconut water, honey syrup, and ice. Stir until all ingredients are well combined. Garnish with pineapple slices, lemon wheels, and strawberry slices. Pumpkin spice may be having a moment, but the humble apple and its good friend the cranberry are the unsung heroes of fall flavor -- especially in this drink. This mix takes that a step further with a nod to edible coziness with grated cinnamon and aromatic bitters for that “the heater is on” feeling. Ginger beer tags along for just the right kind of kick. Add all ingredients except for the ginger beer into the shaker tin. Muddle the orange slice, add ice, and shake! Strain the liquid into a mason jar and top with the ginger beer. Garnish with grated cinnamon and a cinnamon stick. Add lemon juice and orange slices into a tin. Muddle the orange slices well and strain the juice into a punch bowl. Discard those muddled oranges (compost time!). Add ice, and then add all the other ingredients into the punch and stir until well combined. Garnish with cranberries, apple slices and grated cinnamon. Brunch foods and light, easily pairable sparkling wine cocktails are made for each other -- and this one, a twist between the mintiness of an Old Cuban and the grape-fruitiness of a Paloma, is definitely going to be a regular at your gatherings. We’ll bet on it. Add fresh mint leaves to the shaker tin (Pro Tip: If you smack the mint in your hands before adding it to the tin, it'll release the oils and make the flavors pop in the drink!). Follow by adding the Smirnoff Sourced Ruby Red Grapefruit Vodka, lime juice, and honey syrup. Shake it all up and dump contents of tin into a collins glass. Top with sparkling wine and garnish with a grapefruit peel and fresh mint tops. Place mint leaves into your punch bowl (after smacking between your palms to release the oils, that is). Follow by adding the Smirnoff Sourced Ruby Red Grapefruit Vodka, lime juice, honey, and ice, stirring until the contents are well mixed. 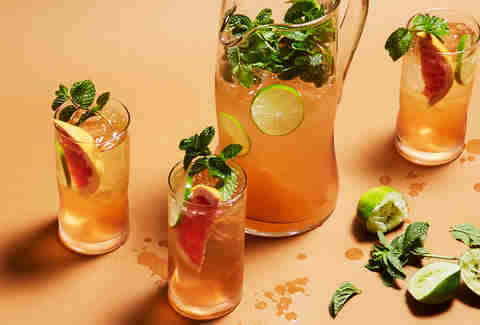 Top with a dry sparkling wine, and garnish with grapefruit wedges, lime wheels and fresh mint tops.